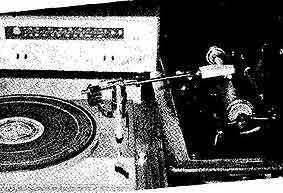 ... the Brooks player, a common tone arm, still on its gramophone, with a common cartridge playing the cylinder on an old phonograph, to ... ... the Poliak player, an optomechanical universal player for discs and cylinders alike, working with literally any turntable, and using laser light. When starting my search for modern phonographs, I didn't think I would find as many as I now present on this site, and I know for a fact that there are several more out there. 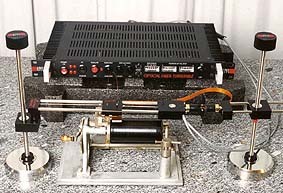 I invite all those of you readers who own or have made your own modern phonograph to participate in the small and exclusive community of Phonograph makers of the world listed below and presented on separate pages on this site. Never mind the elegance or lack of it of your device, what counts in the end is if it will play a cylinder and give an electric output. Just drop me a line (and an image) and I will present it here. If you want an alert when a new player is published here, you may register this page with a monitoring service, such as Watch That Page. Art Shifrin Air delivery U.S.A.
Jack Towers The standard player U.S.A.
Joshua Horn Linear tinfoil U.S.A.
Donald W. Matteson Original tinfoil U.S.A.
Kathleen Morimoto Rough recorder U.S.A.